Infliximab (IFX) has greatly improved the therapeutic options in patients with inflammatory bowel disease. IFX is a mouse–human chimeric antibody to tumour necrosis factor α, and has proven efficacy in active luminal as well as in fistulising Crohn’s disease.1,2 Recent studies have also demonstrated its effectiveness in patients with moderate to severe ulcerative colitis.3 Furthermore, IFX is steroid sparing and significantly reduces the need for surgery and hospitalisations in patients with Crohn’s disease.4,5 In clinical practice, 75–80% of patients will report rapid amelioration of their symptoms within 2–4 weeks after the first infusion, with a response duration of 8–12 weeks on average. Eventually, however, most patients will need re-treatment. Maintenance treatment with 8 weekly IFX has been shown to enable sustained remission and to achieve thorough healing of the gut mucosa.6,7 The ACCENT (A Crohn’s disease Clinical study Evaluating infliximab in a New long-term Treatment) Study has also shown that systematic maintenance treatment is preferred over episodic treatment because the formation of antibodies to IFX (ATIs) is reduced with the former regimen. Still, many doctors use IFX episodically, especially in Europe, mostly because of financial restrictions. However, it is not known which IS drug should be preferred. The IS drug most commonly used in Crohn’s disease is azathioprine (AZA) at a dose of 2–2.5 mg/kg/day or 6-mercaptopurine at a dose of 1–1.25 mg/kg/day. Methotrexate (MTX) is mostly introduced in the case of intolerance to AZA or in the case of side effects of AZA. In this study, we compared IFX levels and ATI formation in three cohorts of patients with Crohn’s disease receiving IFX: one cohort of patients treated with IFX without concomitant IS therapy, one cohort of patients treated with IFX in combination with AZA and one cohort of patients treated with IFX in combination with MTX. Three Belgian centres took part in this prospective proof-of-concept study (University Hospital Gasthuisberg, Leuven, Belgium; Heilig Hart Ziekenhuis, Roeselare, Belgium; Imelda Ziekenhuis, Bonheiden, Belgium; table 1). A total of 174 patients with refractory luminal (n = 138, 79%) Crohn’s disease or fistulising (n = 36, 21%) Crohn’s disease (107 female/67 male) started taking IFX between September 2000 and January 2003 and received re-treatment with IFX in an on-demand schedule (episodic treatment). Patients treated for fistulising disease received a three-dose induction regimen (weeks 0–2–6) and patients treated for luminal disease were given a single induction infusion. In all, 65 patients received concomitant AZA (2–2.5 mg/kg) or 6-mercaptopurine (1–1.25 mg/kg), 50 patients received concomitant intramuscular or subcutaneous (SC) MTX 15 mg weekly (first 12 weeks induction dose of 25 mg weekly) and 59 patients received IFX without concomitant IS therapy. The patients without any concomitant treatment were among the first to enter the study between 2000 and 2001. After the findings of our previous study, which showed that immunomodulators protect against antibody formation,8 a change in policy was adopted and patients were systematically cotreated with immunomodulators (unless intolerant). In the choice between AZA and MTX, AZA was the first choice, followed by MTX in the case of intolerance or side effects to AZA. Within the group of patients treated with concomitant AZA, 46/65 (71%) were taking AZA for >3 months when the first infusion of IFX was administered and 19/65 (29%) were taking AZA together with IFX. In the group of patients treated with concomitant MTX, 34/50 (68%) were taking MTX for >3 months and 16 (32%) were taking MTX together with IFX. All patients were followed prospectively. The decision to administer a new infusion of IFX was individualised in each patient, but it was agreed among the clinicians taking care of the patients that either a loss of response or an acute flare of the disease was necessary to re-treat. This decision was not based on a threshold Crohn’s Disease Activity Index or C-reactive protein level. Serum samples were obtained before and every 4 weeks after each infusion. ATI and IFX concentrations were measured in a blinded manner at Prometheus Laboratories, San Diego, California, USA. Each sample was assessed in duplicate and the reported values are the mean of the duplicate results. Clinicians were unaware of the patient’s antibody status when treating the patients. The IFX assay is a microplate enzyme-linked immunosorbent assay (ELISA) in which IFX bound to immobilised tumour necrosis factor α is detected with horseradish peroxidase-conjugated anti-human IgG (Fc specific). The ELISA value is reported in μmol/ml of serum; the cut-off determined from 40 IFX naive sera (mean (3 SD)) was 1.4 μg/ml and therefore any result <1.4 μg/ml is reported as negative for IFX. IFX concentrations >20 μg/ml were reported as 21 μg/ml for calculation. Negative: the mean concentration for ATIs is <1.693 μg/ml with a serum IFX concentration of <1.4 μg/ml. 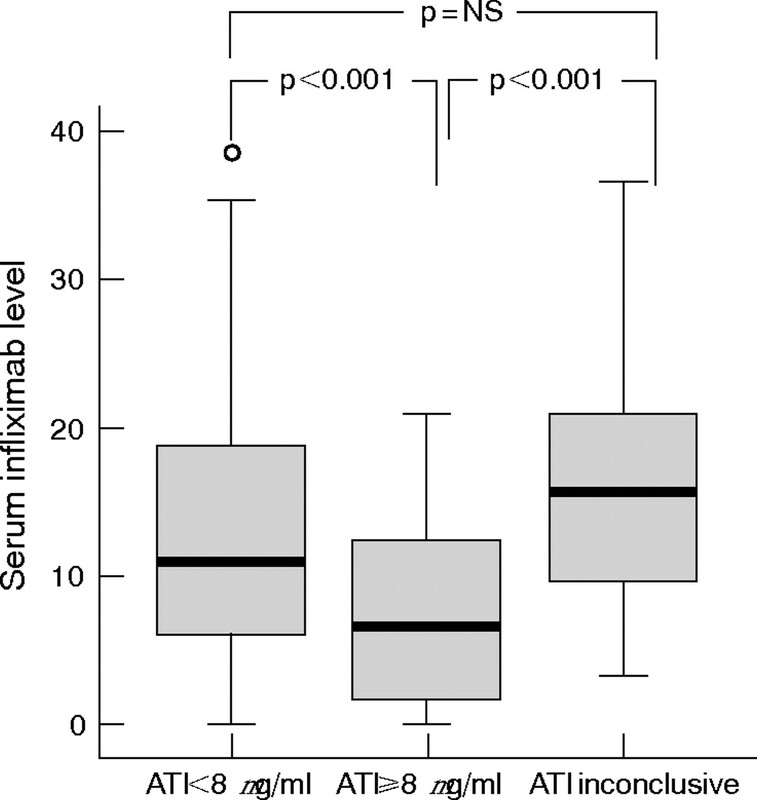 Indeterminate: the mean concentration for ATIs is <1.693 μg/ml but the serum IFX concentration is >1.4 μg/ml. Because the presence of IFX interferes with the ATI assay, the presence or absence of ATIs in these samples cannot be conclusively determined. Positive: the mean ATI concentration is >1.693 μg/ml without detectable IFX concentration (ie, <1.4 μg/ml). Discrete variables were compared using χ2 statistics or Fisher’s exact test when the absolute number in a cell was <5. When data were not normally distributed, results are expressed as medians and interquartile ranges (IQRs). Non-parametric tests (Wilcoxon or Mann–Whitney/Kruskal–Wallis as appropriate) were used for comparison of IFX levels between groups. Only patients with an initial clinical response to IFX and who were re-treated were included in the analyses of ATI and IFX levels. A median of three (IQR 2–5) infusions per patient were administered over a median period of 42 (IQR 25–74) weeks. ATIs were detected in 55% (96/174) of all patients, 24% (42/174) patients were ATI negative and 21% patients (36/174) had indeterminate levels at each of the investigated time points—that is, before as well as 4 weeks after each infusion. Assuming that the samples tested as indeterminate may be considered ATI negative (since IFX was detected in each serum sample), the cumulative incidence of ATI-negative patients was 78/174 (45%). Among the 96 patients who developed ATIs, 27 (28%) displayed low levels of ATIs (<8 μg/ml), 30 (31%) had high levels of ATIs (⩾8 μg/ml) and 39 (41%) had very high levels (⩾20 μg/ml; fig 1). Titres of antibody to infliximab (ATIs) in patients developing ATIs (n = 96). 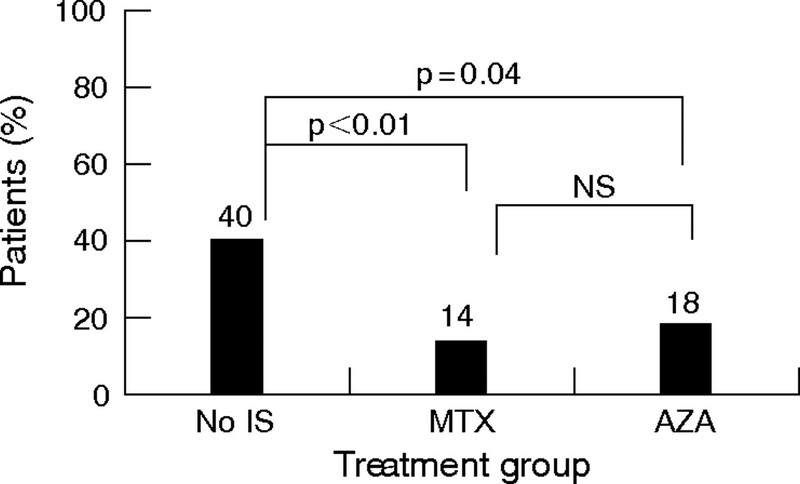 The concomitant use of IS therapy (AZA or MTX) was associated with a lower incidence of ATIs (53/115; 46%) compared with patients not taking concomitant IS (43/59, 73%; p<0.001; fig 2). This difference was observed in both the MTX group (22/50 or 44% ATIs; p = 0.002) and the AZA group (31/65 or 48% ATIs; p = 0.004) compared with the group without IS therapy (fig 3). The incidence of ATIs in patients who started taking IS treatment (MTX or AZA) together with IFX was not different (cumulative incidence 48.6%) from that in patients (44%) taking IS therapy for >3 months. More specifically, in patients taking concomitant AZA, 71% were taking AZA for >3 months and 29% started taking AZA together with IFX. In the first group, 22/46 (47.8%) patients developed ATIs and this was not different from the 47.4% (9/19) positive ATIs among patients started on taking AZA simultaneously with IFX. Among patients receiving concomitant MTX, 68% were taking MTX for >3 months and 32% started taking MTX together with IFX. In the first group, 14/35 (40%) patients developed ATIs and this was not different from the 50% (8/16) positivity among patients who started receiving MTX simultaneously with IFX. Titres of antibody to infliximab (ATIs) and immunosuppressive treatment. Inconcl, inconclusive; IS, immunosuppression; Neg, negative; Pos, positive. Titres of antibody to infliximab (ATI) as a function of cotreatment with methotrexate (MTX) or azathioprine (AZA). Inconcl, inconclusive; IS, immunosuppression; Neg, negative; Pos, positive. We also found that patients who did not develop ATIs had lower baseline white blood cells (median 7.130; IQR 6.000–9.125) than patients who developed ATIs during follow-up (median white blood cells 8.300; IQR 6.800–10.500 for all ATIs combined), regardless of the titres of antibodies (p = 0.018). IFX titres were measured 4 weeks after each infusion. The median IFX titre after the first infusion was 8.6 μg/ml (IQR 4.4–14.0; maximum 21 μg/ml) in the total cohort studied. For the analysis of IFX titres in the view of immunogenicity, we excluded the titres obtained after first infusion as these infusions are always free from ATIs and would therefore falsely inflate the analyses. The median IFX titre in the total group was 5.7 μg/ml (IQR 2.15–11.5; maximum 21 μg/ml; p = 0.006 compared with IFX titres obtained 4 weeks after the first infusion) and was not different in patients treated for fistulising disease (median 6.2 μg/ml (IQR 1–12.65); maximum 21 μg/ml) as compared with luminal disease (median 5.7 μg/ml (IQR 2.3–11.06), maximum 21 μg/ml; p = 0.72). Therefore, we combined both indications for treatment in further analyses. Table 2 shows the median IFX titres stratified for use of IS therapy. Patients not taking IS therapy had lower IFX levels (median 2.42 μg/ml (IQR 1–10.8), maximum 21 μg/ml) compared with patients on concomitant IS therapy (median 6.45 μg/ml IQR 3–11.6; maximum 21 μg/ml), although this failed to reach significance at the 5% threshold level (p = 0.065). On the other hand, there was no difference in IFX levels between patients taking MTX or those taking AZA (table 2). A striking observation of this study was that patients with luminal disease (who had received only one induction infusion) and who developed ATIs during follow-up already had lower IFX trough levels 4 weeks after the first infusion compared with patients who never developed ATIs (median IFX 7.55 μg/ml (IQR 2.65–13.73) compared with 11.15 μg/ml (IQR 5.98–18.98) respectively; p = 0.0011; table 3). Trough levels 4 weeks after the first infusion were lowest in patients with ATIs >8 μg/ml on follow-up (median IFX 6.60 μg/ml (IQR 1.70–12.50)) compared with patients with no or only low ATIs <8 μg/ml on follow-up (median IFX 11.56 μg/ml (IQR 6.45–21.00)) or patients with inconclusive ATIs (median IFX 15.65 μg/ml (IQR 9.93–21.00); Kruskal–Wallis p<0.001; fig 4). Box plots showing infliximab levels 4 weeks after first infusion (median interquartile range) in patients with no or only low antibodies to infliximab (ATIs) <8 μg/ml on follow-up as compared with patients with ATIs >8 μg/ml on follow-up and patients with inconclusive ATIs on follow-up. A trough level of <4 μg/ml measured 4 weeks after the first infusion had a positive predictive value (PPV) of 81% to detect development of high ATIs >8 μg/ml during the later course of treatment, and a trough level of <2.5 μg/ml measured 4 weeks after the first infusion had a PPV of 86% to detect later development of high ATIs. In contrast, trough levels of >15 μg/ml measured 4 weeks after the first infusion were 80% predictive for the absence of ATIs during later follow-up, and trough levels of >20 μg/ml had a negative predictive value of 95% for developing ATIs during follow-up. When stratifying trough levels during follow-up according to the presence of ATIs (table 4), we observed that the presence of ATIs was associated with lower median IFX levels 4 weeks after any follow-up infusion, and this was even more detrimental in patients not taking concomitant IS treatment (median 1.4 μg/ml vs 15.1 μg/ml in the presence or absence of ATIs, respectively; p<0.001), whereas in patients taking IS treatment the same occurred but to a lesser extent (median 4.7 vs 8 μg/ml, respectively; p<0.001). In the group without IS therapy, 12 patients were not re-treated, in the group receiving concomitant AZA 8 patients were not re-treated, and in the group with concomitant MTX, 4 patients were not re-treated because of lack of response, yielding an overall short-term response of 86%. In this analysis, we included only those patients who needed re-treatment within 20 weeks. The median duration of response (ie, time until repeated IFX treatment) in the total cohort was 13.04 (IQR 9.25–18.38) weeks. The presence of ATIs was associated with a shorter duration of response in patients not taking concomitant IS (median 11.71 (IQR 8.60–17.64) weeks) as compared with patients taking concomitant AZA or MTX (median 13.8 (IQR 9.23–19.59) weeks) although this strictly lacked significance, possibly because of low numbers in these subgroups (p = 0.06). In contrast, when no ATIs were present, the duration of response was not influenced significantly by IS cotreatment. We observed no significant difference in response duration between the AZA-treated patients (median 14.29 (IQR 10.33–20.87) weeks) or the MTX-treated patients (median 11.14 (IQR 7.26–16.73) weeks; p = 0.13), regardless of the initiation of these treatments (together with or initiated more than 3 months before start of IFX). In all, 139 of 174 (80%) patients were re-treated and were at risk for infusion reactions. Of this re-treated group, 34 (24%) patients experienced an infusion reaction or, if expressed with respect to the total number of infusions given, 34 reactions out of 414 infusions (8.2%). 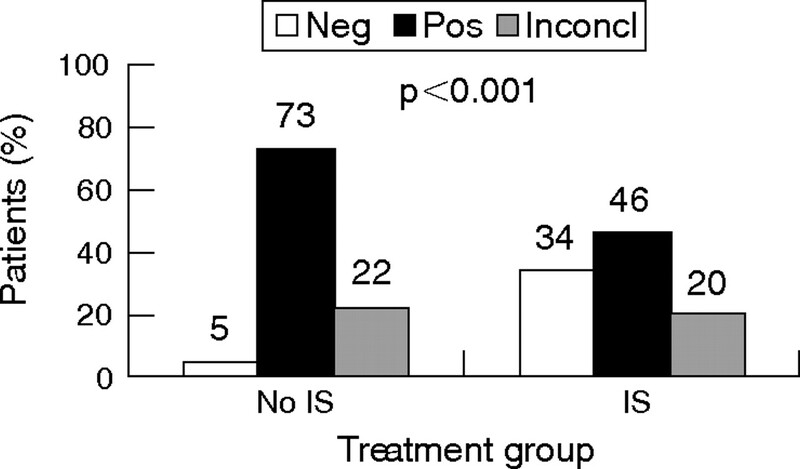 Patients not taking concomitant IS therapy more often experienced infusion reactions (40%) compared with patients taking concomitant IS treatment (16%; p = 0.04; fig 5). There was no difference in infusion reactions between patients treated with AZA (18%) compared with patients receiving concomitant MTX (14%; p = NS). Infusion reactions and immunosuppressive (IS) therapy. AZA, azathioprine; MTX, methotrexate. In a previous study, we have shown that ATI formation is frequent when the drug is given episodically, and that concomitant IS reduces immunogenicity and is associated with a longer duration of response.8 In the present study, we show that MTX and AZA are both equally efficacious in preventing infusion reactions and ATI formation, and this effect is seen irrespective of the duration of exposure to immunosuppressant. Both IS improve the pharmacokinetic profile of IFX. The efficacy data of IFX treatment in rheumatoid arthritis (RA) and Crohn’s disease clearly show the synergistic effect of concomitant IS treatment on IFX response.11–16 There are several hypotheses on why concomitant IS treatment may lead to better efficacy of IFX. A first explanation is that IS reduce the risk of ATI formation as already shown in the past1,7 and as is also clear from the present study. Our study shows that the prevention of immunogenicity by IS may account for a better short-term effect of IFX. A second reason may be that AZA and MTX are additive to IFX in inducing apoptosis of lamina propria T lymphocytes and monocytes. Induction of apoptosis has been shown to be one of the main mechanisms of action of IFX and adalimumab.17–20 Recent data suggest that AZA and MTX are also capable of inducing apoptosis, which could lead to a synergistic effect with IFX. In vitro experiments in peripheral blood mononuclear cells (PBMCs) showed that combination therapy with IFX and IS was associated with an increased induction of PBMC apoptosis and also better suppression of stimulated PBMC proliferation as compared with monotherapy.21 A third mechanism might involve interaction between both drugs. Studies in patients with RA showed that MTX reduces the clearance of IFX, pointing towards an interaction between both drugs.11,22 This interaction has also been shown for IFX and AZA in patients with Crohn’s disease. Roblin et al23 observed a significant increase in 6-thioguanine nucleotide levels within 1–3 weeks after first IFX infusion (p<0.001), without a change in thiopurine S-methyltransferase enzyme activity. In their study, an increase in 6-thioguanine nucleotide of >400 pmol/8×108 erythrocytes was strongly related to a favourable response to IFX, with a predictive value of 100%. There are very few studies that directly compared the efficacy of AZA and MTX. A double-blind randomised study by Jeurissen et al24 compared AZA and MTX in patients with RA in whom parenteral gold and/or d-penicillamine treatment had been unsuccessful. Patients were randomly assigned to AZA (100 mg daily; n = 33) or oral MTX (7.5 mg weekly; n = 31) and were followed up for 48 weeks. At 6 months, significantly more improvement was noted in the MTX group in terms of swollen joints, pain, erythrocyte sedimentation rate, C-reactive protein level and disease activity score, and overall results showed that MTX was superior to AZA in the treatment of RA. Nevertheless, the situation may be different in Crohn’s disease where oral MTX has not proven efficacious.25,26 A reason for this is that the absorption of MTX is highly variable and, when compared with oral dosing, intramuscular administration gives more consistent blood levels. However, no randomised studies that have directly compared AZA with MTX in Crohn’s disease are available. The present study again shows that episodic treatment with IFX is not a good strategy in Crohn’s disease. When it comes to immunogenicity, it is clear from the large randomised controlled trials and cohort studies that maintenance treatment is preferred over episodic treatment to reduces the risk of antibody formation. Also, the concomitant use of IS and pretreatment with steroids reduces the risk of ATIs and of infusion reactions. Which of these strategies will optimally protect the patient is, however, unclear. In the ACCENT I Study, the lowest incidence of infusion reactions occurred among patients receiving both steroids and IS (8%) compared with patients receiving only IS (20%) or only steroids (23%).1 Our data show that even episodic dosing with concomitant IS therapy still leads to antibody formation in 46% of patients. These patients are very likely to lose clinical response. Maintenance treatment is also superior to episodic treatment for other reasons. The most important advantages of systematic treatment over episodic treatment include better response and remission rates, more thorough mucosal healing, better quality of life and reduced number of disease-related surgeries and hospitalisations.5–7 These effects are probably the consequence of sustained serum IFX levels. In the ACCENT I Study, the difference between scheduled dosing and episodic dosing did not reach statistical significance on all clinical end points; however, follow-up was relatively short (54 weeks) and the design of the study allowed for dose escalation in the case of loss of response. In fact, almost half of the patients in the episodic dosing group (92/188) had crossed over to the active treatment by week 54. A striking observation in the present study was the fact that patients who developed ATIs during follow-up already showed lower IFX levels 4 weeks after the first infusion compared with patients who never developed ATIs. Moreover, an IFX level of <4 μg/ml measured 4 weeks after the first infusion had a PPV of 81% to detect the development of high ATIs during the later course of treatment, and an IFX level of >15 μg/ml measured 4 weeks after the first infusion was 80% predictive for the absence of ATIs during later follow-up. Therefore, IFX levels measured early after the first infusion of IFX (at 4 weeks) are a good prognostic parameter for development of immunogenicity. It is at present not known for how long IS with AZA or MTX in combination with IFX should be continued. If IFX is used as a bridge to AZA, a three-dose induction regimen with infusions given at weeks 0, 2 and 6 should be sufficient, whereafter AZA can be continued alone. However, the recent results of the French GETAID (Group Of Therapeutic Research On The Disease Of Crohn And The Hemorrhagic Rectocolite) were somewhat disappointing in supporting this strategy because the patients who received IFX induction continued to perform better even at 6 and 12 months after starting AZA.27 A different scenario is the one where IFX is administered on an 8-weekly basis and it is not clear how long concomitant IS therapy should be continued in these patients. In conclusion, in this study we have shown that concomitant IS treatment reduces the immunogenicity of IFX treatment and is associated with higher IFX levels. We also show that there is no difference between MTX and AZA at reducing the risk for development of antibodies. A striking finding of this study is that the formation of antibodies occurs very early and readily influences the pharmacokinetics of the first IFX dose. Hanauer S B, Feagan B G, Lichtenstein G R, et al. ACCENT I Study Group. Maintenance infliximab for Crohn’s disease: the ACCENT I randomised trial, Lancet2002;359:1541–9. Sands B E, Anderson F H, Bernstein C N, et al. Infliximab maintenance therapy for fistulizing Crohn’s disease. N Engl J Med2004;350:876–85. Rutgeerts P, Sandborn W J, Feagan B G, et al. Infliximab for induction and maintenance therapy for ulcerative colitis. N Engl J Med2005;353:2462–76. Lichtenstein G R, Yan S, Bala M, et al. Remission in patients with Crohn’s disease is associated with improvement in employment and quality of life and a decrease in hospitalizations and surgeries. Am J Gastroenterol2004;99:91–6. Lichtenstein G R, Yan S, Bala M, et al. Infliximab maintenance treatment reduces hospitalizations, surgeries, and procedures in fistulizing Crohn’s disease. Gastroenterology2005;128:862–9. Rutgeerts P, Feagan B G, Lichtenstein G R, et al. Comparison of scheduled and episodic treatment strategies of infliximab in Crohn’s disease. Gastroenterology2004;126:402–13. Miele E, Markowitz J E, Mamula P, et al. Human antichimeric antibody in children and young adults with inflammatory bowel disease receiving infliximab. J Pediatr Gastroenterol Nutr2004;38:502–8. Maini R N, Breeveld F C, Kalden J R, et al. Therapeutic efficacy of multiple intravenous infusions of anti-tumor necrosis factor α monoclonal antibody combined with low-dose weekly methotrexate in rheumatoid arthritis. Arthritis Rheum1998;41:1552–63. Parsi M A, Achkar J P, Richardson S, et al. Predictors of response to infliximab in patients with Crohn’s disease. Gastroenterology2002;123:707–13. Vermeire S, Louis E, Carbonez A, et al. Demographic and clinical parameters influencing the short-term outcome of anti-tumor necrosis factor (infliximab) treatment in Crohn’s disease. Am J Gastroenterol2002;97:2357–63. Arnott I D, McNeill G, Satsangi J. An analysis of factors influencing short-term and sustained response to infliximab treatment for Crohn’s disease. Aliment Pharmacol Ther2003;17:1451–7. Mortimore M, Gibson P R, Selby W S, et al. Early Australian experience with infliximab, a chimeric antibody against tumour necrosis factor-alpha, in the treatment of Crohn’s disease: is its efficacy augmented by steroid-sparing immunosuppressive therapy? The Infliximab User Group. Intern Med J2001;31:146–50. Laharie D, Salzmann M, Boubekeur H, et al. Predictors of response to infliximab in luminal Crohn’s disease. Gastroenterol Clin Biol2005;29:145–9. Van den Brande J M, Braat H, van den Brink G R, et al. Infliximab but not etanercept induces apoptosis in lamina propria T-lymphocytes from patients with Crohn’s disease. Gastroenterology2003;124:1774–85. Lugering A, Schmidt M, Lugering N, et al. Infliximab induces apoptosis in monocytes from patients with chronic active Crohn’s disease by using a caspase-dependent pathway. Gastroenterology2001;121:1145–57. Shen C, Maerten P, Geboes K, et al. Infliximab induces apoptosis of monocytes and T lymphocytes in a human-mouse chimeric model. Clin Immunol2005;115:250–9. Shen C, Assche G V, Colpaert S, et al. Adalimumab induces apoptosis of human monocytes: a comparative study with infliximab and etanercept. Aliment Pharmacol Ther2005;21:251–8. Chaudhary R, Butler M, Playford R, et al. Combination immunomodulatory therapy with infliximab increases mononuclear cell apoptosis in-vitro compared to infliximab alone. Gastroenterology Suppl. 2005;A :149. Schwab M, Klotz U. Pharmacokinetic considerations in the treatment of inflammatory bowel disease. Clin Pharmacokinet2001;40:723–51. Roblin X, Serre-Debeauvais F, Phelip J M, et al. Drug interaction between infliximab and azathioprine in patients with Crohn’s disease. Aliment Pharmacol Ther2003;18:917–25. Jeurissen M E, Boerbooms A M, van de Putte L B, et al. Methotrexate versus azathioprine in the treatment of rheumatoid arthritis. A forty-eight-week randomized, double-blind trial. Arthritis Rheum1991;34:961–72. Arora S, Katkov W, Cooley J, et al. Methotrexate in Crohn’s disease: results of a randomized, double-blind, placebo-controlled trial. Hepatogastroenterology1999;46:1724–9. Oren R, Arber N, Odes S, et al. Methotrexate in chronic active ulcerative colitis: a double-blind, randomized, Israeli multicenter trial. Gastroenterology1996;110:1416–21. Lemann M, Colombel J, Duclos B, et al. Infliximab (IFX) in steroid dependent Crohn’s disease (CD) patients treated with azathioprine (AZA) or 6-MP: a randomised double-blind placebo controlled trial. Gut Suppl2003;52:A44.